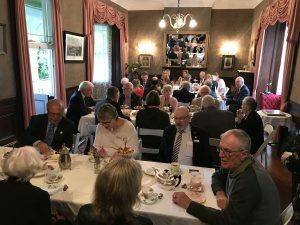 Past Presidents, Life Members and Auckland Regional Representatives gathered at historic house “Alberton” this afternoon: the reason, two-fold. First, present President, Sherryl Wilson wished to gather together and thank those who put in so much time and effort over the decades to support and further Justices of the Peace initiatives in Auckland. Among those attending was Alice Wylie, QSM, whose service began in the 1960s. The second reason for the get-together was to make a start on gathering our recent history in preparation for celebrations to mark the Association’s centenary in October 2022. “It’s not too soon to start thinking about collecting photos and stories for this milestone” said President Sherryl Wilson… and some of those present today contributed brief anecdotes and amusing recollections during afternoon tea, after which photographs were taken on the picturesque verandah steps at “Alberton”. Members, families and friends who have material or artefacts to contribute that will help tell the Association’s history are asked to get in touch with the Registrar, Janet Thompson. Hard or soft copies will be acceptable and originals can be copied and returned if necessary.